Canon PowerShot N to the Rescue? In my recent TechHive article titled, Can Canon save the point and shoot?, I noted that compact camera sales have languished over the last two years. Canon aims to shake up the point and shoot market with a truly unique camera. I think there are three primary reasons for the doldrums. Money is tight and consumers probably already have an older camera around the house. Tantalizing smart phones such as the iPhone and Galaxy S have terrific cameras; good enough to be seen as replacements for aging compacts. Point and Shoots were not innovating. This year's model looked just like last year's. My guess is that Canon started working on the PowerShot N a couple years ago when the decline began. What they came up with is innovative, attractive, functional, and refreshing. The PowerShot N complements your mobile photography; it doesn't compete with it. It features a powerful 28-224mm optical zoom, 12 MP sensor, touchscreen LCD that flips open, one button WiFi connectivity to your mobile device, stunning creative filters that can automatically be applied, and it's "shirt pocket" small. It looks different than every other compact on the planet, and once paired with the Canon CameraWindow app for iOS or Android, will help you post more impressive images on Instagram, Flickr, Facebook, and Twitter. I've already preordered the PowerShot N in black for $299 to use for my mobile photography. I'll let you know when I receive it, hopefully in April as planned. For more details about the camera itself, check out my TechHive article. And for myself I see it hitting the pavement withing a week of getting it. Please let me know where you attach the wriststrap. There are lugs on both sides of the camera to attach the included wrist strap. 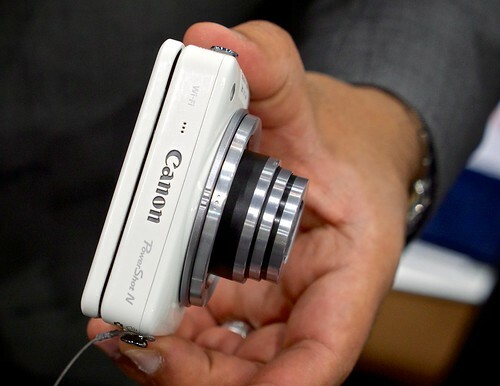 Plus Canon is working on a number of accessories so you will have different options for securing the PowerShot N.